With cashless payment systems becoming the standard, credit card readers are becoming an asset to any vending machine. Customers can pay with their cell phones and more and more are doing so. 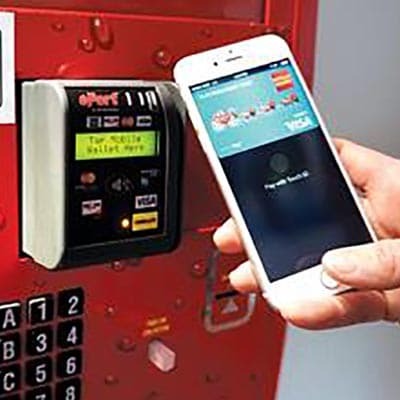 USA Technologies, the leading developer in cashless systems, reports credit card payments increase average vending machine sales by 30 percent over cash, with another 15 percent boost from mobile payment apps. The credit card reader has more than proven itself to be a worthy investment among vending franchises. So how does a vending machine business owner decide which credit card reader would be best for their machine? We have provided a comparison of the three major companies in cashless devices which we deal with. Nayax is a global leading cashless, telemetry, management & solutions provider for the unattended machine industry. Established in 2005, Nayax has over 200,000 devices installed worldwide. VPOS is a full service vending payment solution that is secure, durable, and reliable. VPOS accepts magnetic stripe cards, newer chip cards, as well as contactless cards and mobile wallets. Additionally, it enables voice interaction with your consumer. VPOS is easy to install and use and is compatible with all automated machine standards. The terminal fee, interchange fee, acquire processing fee, and the merchant account fee are all included in the monthly service package from Nayax. There is a $30 activation fee for a Nayax Account, a $7.95 per month per modem maintenance fee, and a 5.95% transaction fee per swipe. Fees may vary so please confirm with the actual company. For the Vending Operator, Nayax has the MOMA app which offers mobile management and monitoring for your machine. Likewise, for your customers, Nayax has the MONYX app which offers a way for you to market your business and nurture customer loyalty by connecting you with your consumers. Customers can get vouchers and loyalty cards through the app, make payments at the machine via their phone and get instant refunds. We have found that Nayax has excellent customer service. 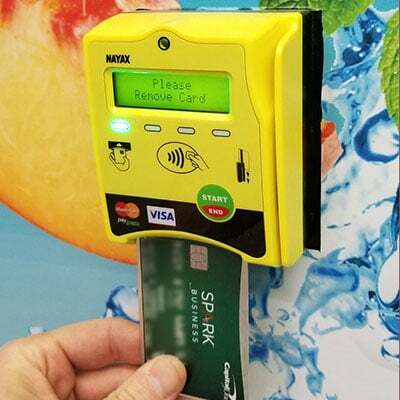 We work directly with a representative of the company and he does his best to help each and every one of our customers have a good experience with their Nayax card reader. Our customers can call him with all of their questions and issues. He will assess needs and get them to the person within the company that can best meet those needs. He is very knowledgeable and is quick to return a call or email. It’s great that we have a dedicated representative to deal with. AirVend, Inc. is a privately-held company that operates in the computers, electronic products & components manufacturing industry. This company was founded in 2012. AirVend was acquired by 365 Retail Markets in 2015. 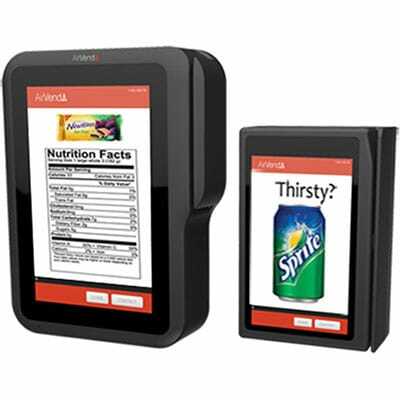 AirVend is an interactive touchscreen device that displays nutritional info, provides cashless options, and sends real-time data and alerts wirelessly. 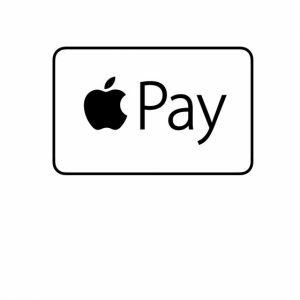 It accepts traditional magnetic stripe cards as well as contactless cards and mobile wallets. 365 Retail Markets/ AirVend charges the vendor a monthly service fee of $14.95 per device plus a transaction fee percentage determined by the average purchase amount – typically around 5.95%. Fees may vary so it is always best to confirm with the actual company. The 365Pay app is AirVend's mobile app for your customers. They can use this app to access product and nutritional information, send cashless payments, reload funds and send feedback via email to the operator. Also, they hope to add a loyalty program in the next few months. While AirVend may have had a more popular product in the past, the customer service had really declined. As a result, one could possibly attribute this to the merger of companies causing much oversight and neglect in this department. However, in calling to do research for this article, I received a quick response to my phone call and the sales person who responded was very knowledgeable and helpful. Hopefully this signals a turnaround in their customer service response. Customers needing to set up accounts or calling in with support issues should receive a higher quality of care from AirVend. USA Technologies was founded in 1992. The company is recognized as a leading provider of wireless, cashless, micro-transactions and networking services. The ePort is a two-piece card reader and telemetry system that supports both traditional magnetic stripe cards and also, newer, NFC technology found in contactless cards and mobile wallets. It has a minimalistic design and superior security features. 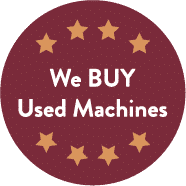 USA Technologies charges the vendor a monthly service fee, plus a transaction fee percentage determined by the average purchase amount. Monthly Fee: $7.95 per month, per device. Transaction Fee: 5.95% Fees may vary so please confirm with the actual company. The MORE mobile app from USA Tech is a great way to provide consumer engagement services. Customers can get information on products, see advertising and special offers as well as make payments. They can earn rewards and choose to redeem those rewards for credits or free vends. They can also find participating machines via the app. The consistency of this company in their products and customer service is great. The ease of communication between consumers and USA Technologies is seamless. Being the leading developers in cashless technology, they have set up a system that works and they are sticking with it. Products are readily available, affordable, and customer service is there to help you every step of the way. 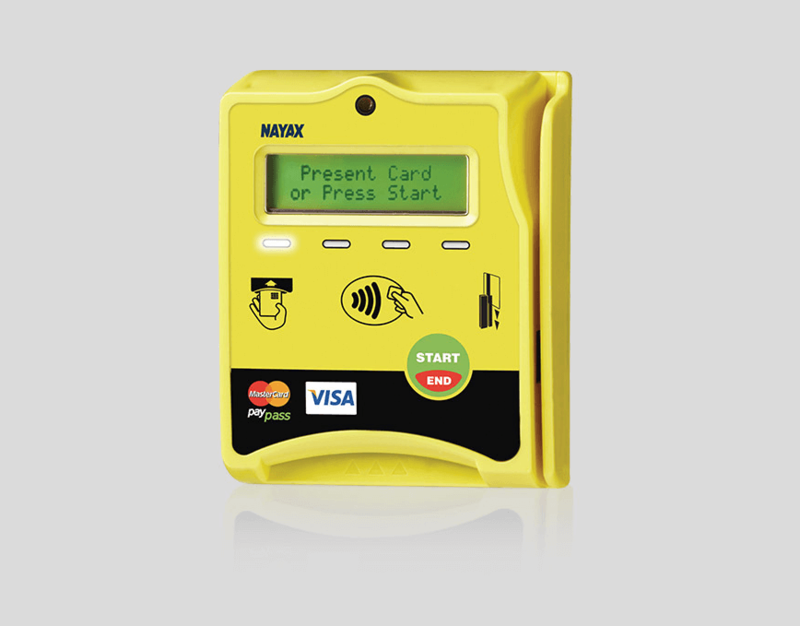 We sell new Nayax credit card readers to install on your vending machines. In an increasingly cashless society, don't miss out on potential vends because you can only take cash! In summary, all three of these companies are offering great technology, various mobile applications and consistent customer care. The choice of which credit card reader can assist you the most in your vending goals is yours. In addition, you can get more information about each of these companies and their credit card reader options on their individual websites. Next, visit our blog to learn more helpful vending tips.